Six Until Me. : Opsite Flexifix: You Can Stick Around. Opsite Flexifix: You Can Stick Around. A few days before I headed to San Diego, I slapped on a new Dexcom sensor. And when I was ready to fly out on Sunday morning, I noticed that the edges of the sensor adhesive were peeling back. I casually mentioned this to a new acquaintance of mine, and she immediately started talking about "optiflex something tape?" and suddenly, a patch of it appeared from the depths of her purse. Which is how I ended up at a conference with my pant leg hitched up to my hip, asking an almost-stranger to tape down the edges of my medical device. On one side of the tape, it says "REMOVE FIRST." I can take a hint; so I pulled that side of the tape off first and stuck it to my thigh (around the sensor). Then I pulled the grid layer off, which left a flexible, bandaid-esque cover (cover band?) over my entire sensor. It was a little clumsy for me to put on, because the tape is super-sticky and trying to settle it down is like keeping a length of saran wrap from getting all lumpy. But now it's on, and I don't feel it or notice it, and hopefully it will keep the sensor stuck fully and happily. 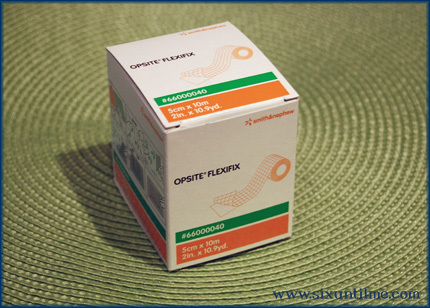 Opsite Flexifix didn't ask me to write about this. They didn't send me free stuff (but if they'd like to credit my Amazon account so I can buy more ribbons for the baby's hair, that would be badass), and they have no idea I've mentioned their product on my site. But I had to: that one good turn in San Diego deserved another. And this Optimus Prime tape stuff rules. That said, I've recently discovered that soaking the adhesive patch of the sensor with SkinTac a few hours after inserting means it'll stay nicely stuck for a few days before it needs taping. LOVE this review! We've been having trouble with Kaceys Dexcom coming unstuck too so this looks like something we can try :) Thank you!! sadly, gives my son a rash when used to cover the whole sensor/transmitter (MM) Unfortunately, we're not alone with that. So now we just use it on the front part of the sensor only, in a tiny quantity. The rest is covered with hypafix. Thanks so much for posting the info. I just ordered myself some from Edgepark. Hoping my insurance covers it! I don't have too much of a problem with the sensors staying on but there are times when the adhesive could be more stuck. I actually work the same sensor for over 20 days (twice) with no adhesive help! Perhaps I'll give this a try, but I'm afraid the result will be what it always is for me and tape products: it causes a rash (Tegaderm, Transpore tape, Micropore tape...they all make me red & itchy). Like Caro, I've been using SkinTac (the kind that comes in the bottle, which I hear is stronger?) on the adhesive patch before I apply, and I got 12 days out of my last sensor before I was afraid it was just going to fall off. I use this stuff and it works well. I put it on when the Dex adhesive starts to come up. But I don't cover the whole thing -- I just cut strips off for the problem side(s). Covering the whole things sounds like a better idea, but cutting that square out can't be easy. I love this stuff! I use it for every sensor now. Found it works best when you cut out a piece in the shape of the sensor and then put it on the sensor right at the beginning of day 1. After showers, I use a tissue to dab the moisture away from the edges of the sensor to make the adhesive last a bit longer. A friend turned us on to Flexifix (for our 3 yr old + Dex), and we love it, too! Tagaderm gave him redness and rash - not Flexifix. This tape seriously rocks! I use it to keep my son's pump sites in his arm. The site used to fall off every time he showered or swam. Now, the Opsite tape works so well, I actually have a hard time getting the tape OFF. I soak it with De-Solv-It ($8 a bottle at ACE Hardware), which works like a charm. Skin-Tac works great. You also need the remover to release it. I love that stuff! The first time I used it, I didn't realize the green plaid part was supposed to come off - I thought that was some pretty ugly tape! I don't cut a whole in the middle of mine. I just cut 4 pieces and put them on each side. SkinTac does wonders for me. I put a donut shaped circle of SkinTac on wherever I'm going to put my new sensor, let it dry for 5 min or so, then put sensor over it, with needle in the non SkinTac'ed center of the donut. I've been getting 2-3 weeks out of those suckers lately. How does this stuff compare to Tegaderm? Besides the obvious grid-action, is there a significant difference? Sweat seems to kill the adhesive on the Dex, so I have been using Tegaderm. But I'm pretty sure we have some opsite at work that I could snag (I mean borrow). Thanks! Like many of the comments above, I have redness and irritation problems with most tapes, but not Flexifix. Been using this stuff for years. It not only keeps my CGM (medtronic) on for a long time it keeps it stabilized so I have no problems with readings being all over the place. Also no rash on my sensitive skin! I generally get 14+ days out of a sensor, and it's only because the tape is completely flaking off that I end up having to pull them. PS, your Jim J. Bullock reference was remarkably excellent. So glad the tape worked for you! And love the photos! srsly, quoting tight-rolled jeans and jm j bullock in the same post? so much smiling over here, man. @ Michelle - we had a rash problem with my sons MM sensor when it was completely covered as well. We solved it with a piece of moleskin stuck to the back of the transmitter. Once we did that, his skin could breathe and no more rash, even completely covered. I guess the gridlines are there to help you cut out the right size hole? I've been thinking about switching adhesives on my Medtronic CGM, but cutting the hole seems like too much work. (Plus, given the way that the MM transmitter just flops around, unlike the Dex which snaps into place, a hole wouldn't really help me. 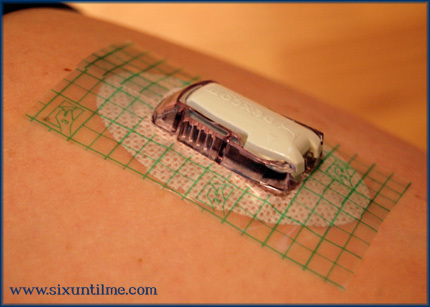 I've thought of trying 3M Medipore tape (search for "Changing Lucy's CGM Sensor on YouTube to see it hold a sensor on a baby... a very touching video), but maybe should try this. Do you, or anyone, have experience with that stuff? YDMV? thx for review excited to try this, maybe it'll finally make me feel like paying for the damn sensors is worth it! This tape works great for me too. Even through many sweat heavy days of basketball, is usually works great. Love it! has anybody tried blenderm? that is what dexcom recommends to stop the rashes, but still have it stick down. i was just about to buy it, but maybe i'll try this instead? Hmmm...interesting. Will have to keep this in mind if we ever need such a tape. 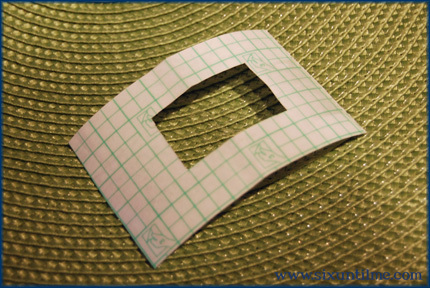 We used to do the exact same thing for my daughter (cutting out the hole for the sensor) but with tegaderm. That didn't work because of the moisture build up underneath when in the pool and bath (she's 5). Nobody who left you a comment mentioned what we use. It's called Compound Tincture of Benzoin U.S.P., 10% Swabsticks. We use one swab each time to make an oval where the tape on the dex will go. It is MUCH stickier than skintac and iv prep. We get two weeks out of our dexcom every time using this stuff. This post makes me insanely happy. I have been (unsuccessfully) cutting Tegaderm for months now. And the tight roll reference made me laugh out loud! I use 3M Blenderm and it works very well.